Often children will complain of pain in one or both heels with running, sports or walking, usually at the back of the heel or under the heel. The cause of heel pain in children is a condition called calcaneal apophysitis, usually affecting 8 to 14-year olds. What causes Sever's Disease ? Heel pain is very common in children because of the very nature of their growing feet and legs. 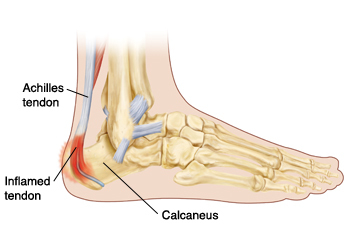 In children, the heel bone (the calcaneus) is not yet fully developed until the age of 14 or older. Until then, new bone is forming at the growth plate (the apophysis), a weak area located at the back of the heel. Repetitive stress on the growth plate (due to walking, running and sports) causes inflammation in the heel area. Because the heel's growth plate is sensitive to repeated running and pounding on hard surfaces, pediatric heel pain often reflects high activity. Children and adolescents involved in footy, soccer, running, or basketball are especially vulnerable. 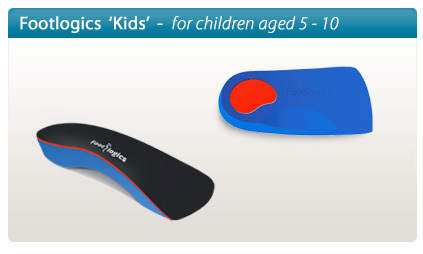 Over-pronation (fallen arches and rolling inwards of the feet) will increase the stress on the growth plate and is therefore a major contributing factor to heel pain in children. If pain persist, you should consult a podiatrist.